If you’re an angler or spend a lot of time on the water, a SUP cooler is one of the best SUP accessories you can purchase. It’s a versatile accessory that can be used for storing beverages on shorter trips or longer treks on hot days or fill it up with snacks. At the same time, the cooler can be outfitted with tracks for fishing accessories like rod holders, drink holders and camera booms. A paddle board cooler can also help with overall stability, fishing, provide a seat to sit on when you get tired and help beginners learn how to balance. In our 2019 SUP cooler reviews, we’ve compared the best SUP coolers because we know a high-quality cooler is an investment you’ll enjoy for many years to come. This will help you pick the best cooler for a SUP to bring along on your next paddling adventure. If you’re an active paddler, the SSBC-ISUP cooler is an essential paddle board accessory you can’t do without. 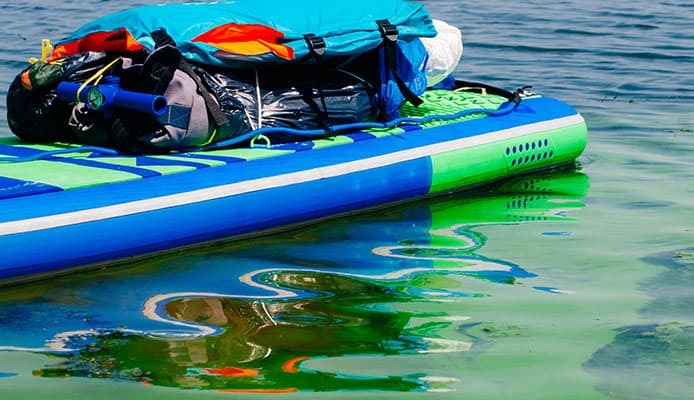 This paddle board cooler is of the best quality, durability, design and value for those paddleboarders looking to easily keep drinks cold and securely fastened to their paddle boards.The SUP cooler bag uses water-resistant materials and zipper to keep cooler items cold and water from entering the cooler. The cooler is lined with thick insulation for maximum coldness while the Mesh netting Pocket on top of the cooler allows for convenient storage of personal items.You can secure the cooler to the paddle board deck via the 4 clips and telcos straps. The telcos straps will allow you to snugly fasten and secure your cooler to your paddle deck for safe and icy transportation of drinks while out on the water. The waterproof insert functionality on SUP-Now paddle board accessories cooler is spot on. Sometimes you may need to take essentials like phones, water bottles and keys with you on the board. This is no longer a problem. Waterproof insert will keep your items safe and also keep your beverages and food ice cold. You can even use your phone while it’s in the waterproof insert to take pictures while out on the water. The cooler also has two additional storage compartments; the outside storage compartment for storing keys and phones while the inside storage compartment is for items that need to be kept cold but not directly in the ice like fruits. Apart from keeping your beverages and food cold, NorthShore’s SUP cooler also has an easy attachment system. The nylon cooler mounts easily to the deck using 2 rubber plates with Spectra Loop and NSI’s deck mount attachment system. 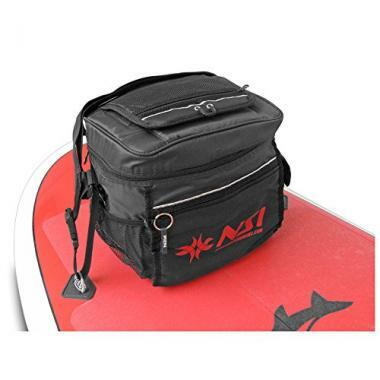 This SUP fishing cooler also has an over the shoulder strap for off-board carrying convenience. Also included are female/male buckles with webbing and a bottle opener. A SUP cooler is one of the best SUP accessories you can purchase if you want to have some fun on the water or are an angler. It’s also a versatile accessory that can be used to do more than just paddle boarding. Below are factors that will help you choose the best cooler for a SUP. The size of the cooler you choose will depend on the items you want to take with on the water as well as storage for your catch. Coolers with paddle board accessories are the best. 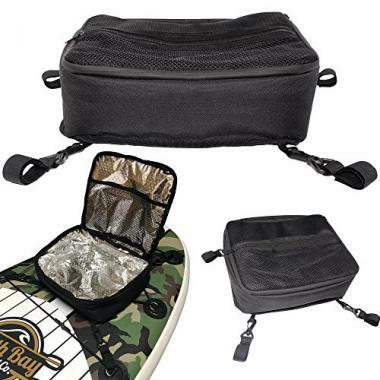 They’re equipped with the paddle board cooler and SUP deck cooler bag to help you store your personal items, keep cooler items cold and prevent water from entering your cooler. This will depend on the number of drinks, cooler items, cans or food you want to take with you. If you’ll be taking with you items that need to be protected from water damage such as phones and cameras then buying a cooler with waterproof capabilities will be a good choice for you. This is one of the top qualities you should look out for. You don’t want to end up with a cooler that can’t keep your fish and drinks cold for longer. Ice retention will also maintain the freshness of your food. A cooler that has attachment straps will make things easier for you. The straps will enable you to secure and fasten your cooler to the deck for safe and icy transportation of drinks when out of the water. Q: Why Use A Cooler For SUP? Allows you to use your paddle board in conditions that could have made you leery. 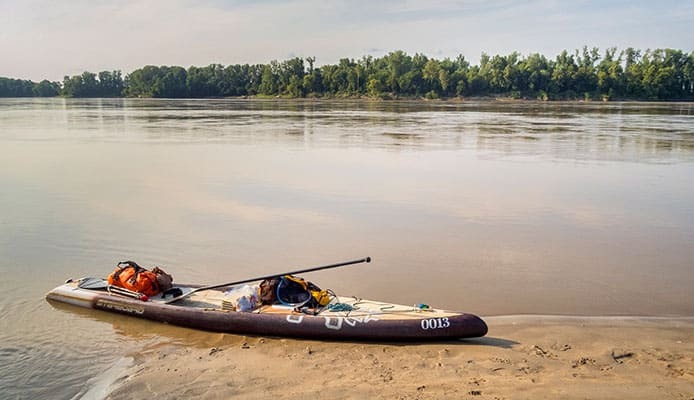 Enable you stay out on the water for a long period because of using different muscle groups when paddling from both a standing and seated position. Q: What Is The Difference Between A Regular And SUP Cooler? They’ve the ability to freeze fresh fish caught on your fishing trip. They’ve thicker insulation compared to regular coolers and will keep the contents in your cooler cold. They’re built with stainless steel, a rust-resistant component since they’re always exposed to salt water. 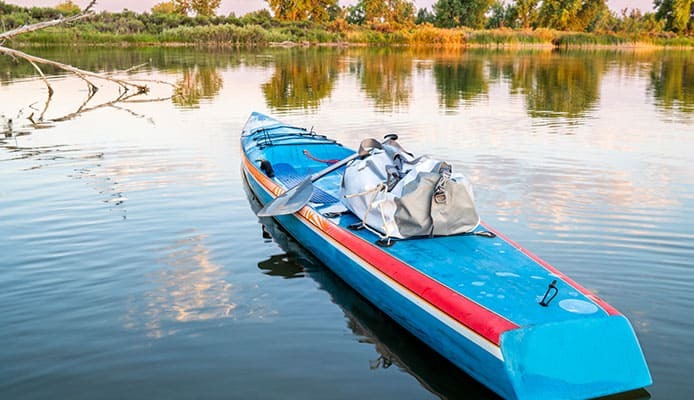 They’re equipped with non-slip feet and the ability to tie them securely to your boat while still being able to access the contents in the cooler. They’ve markings on the lid either in centimetres, inches or both to allow you measure the fish you caught. Q: How To Clean A SUP Cooler? Clean the inside with mild soap and warm water. Use baking soda and water to remove tough stains. Always clean after use especially if used in salty water. Only hand wash.
Use a diluted solution of chlorine bleach and water to remove odours. If odours persist, use a cloth saturated solution with vanilla extract to wipe the interior and leave it in the cooler overnight. Before storing, air dry the cooler while the lid is open to reduce the risk of mildew and mold growth. All the above coolers can store everything you may need for a sup fishing adventure and offers amazing insulation. They’re reliable in all conditions and will suit your needs whether you’re going for a short swim or a long trip. They’re also pocket-friendly.